Telenor Satellite approves C-COM's Ka-band auto-deploy antennas. Ottawa, October 2016: C-COM Satellite Systems Inc., the leading global provider of mobile auto-deploying satellite antenna systems, has announced that it has received type approval for its iNetVu® Driveaway and Flyaway antenna systems from Telenor Satellite, a major satellite provider of broadcast and data services throughout Europe and the Middle East. The iNetVu® Ka-98G Driveaway and the iNetVu® FLY-98G 3-axis transportable, along with the advanced 7710 auto-acquire controller, was able to deliver in excess of 10Mbps upload and download rates over Telenor’s THOR 7 High Throughput (HTS) satellite. THOR 7, positioned at 1o West, offers 6-9 Gbps throughput with up to 25 simultaneously active spot beams in Europe and the Middle East. 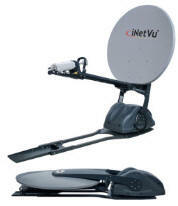 “C-COM’s next generation vehicle mounted and transportable antennas continue to rack up approvals with first class satellite operators and service providers, most recently with Telenor on THOR 7,” said Drew Klein, Director of International Business Development for C-COM Satellite Systems Inc.
“Customers can now easily roam between beams with C-COM’s 3-axis motorization and our auto-polarization switching function. This will give Telenor customers the option of a fully approved, land based system capable of finding satellite in just a few minutes with the press of a button,” Klein continued. The test was assisted by a leading European C-COM partner, Primetech UK. “Primetech are delighted to work with both C-COM and Telenor Satellite in achieving type approval of the iNetVu 98G series,” said Henry Walker, Managing Director of Primetech. “The addition of the Telenor Ka-band service using a world renowned product is a huge benefit, particularly where reliability in the provision of resilience is crucial,” Walker continued.